Before the start of their daughter’s wedding, one couple wanted to increase the space in their home, using a modern conservatory. They wanted to make sure there was a seamless blend into the outside area, creating a practical and open space. Abbey Windows were proud to encourage their end-goal. With the theme ‘modern and contemporary’ in mind, they were able to find the conservatory of their dreams that would increase their space and light with the use of high-performance windows. This couple had the idea of including a modern, creative space in their home, in order to brighten their house and enhance their space provided. Wanting a space that matched the theme of their home, Abbey were able to create a colour theme that complemented the existing architecture. Working around the theme of ‘modern and contemporary’, Abbey Windows were able to assist them in designing the perfect conservatory that can be installed quickly and easily, with minimal mess. With their creative idea and vision in mind, we came up with a solution that was the perfect fit for their Reading home. The solution incorporated all the features and benefits they expected. 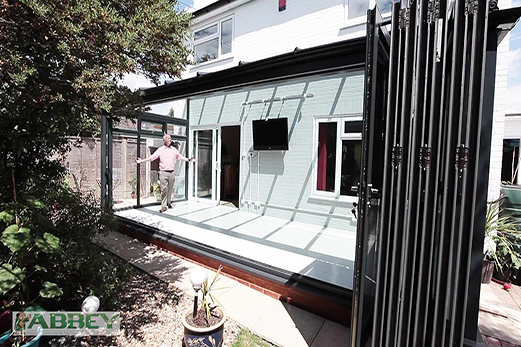 We worked with the couple to design a grey conservatory that enhances their living space. With large, double-glazed windows, the conservatory attracted large amounts of natural light. Their dream grey conservatory expertly combined clean aesthetics with practicality to offer them a versatile space fit for any purpose. They wanted a space that can create a seamless transition from their home to their surrounding area, which is why they decided to install our aluminium bi-fold doors. The bi-fold doors utilise a smooth concertina opening, making sure they can make full use of the space available. 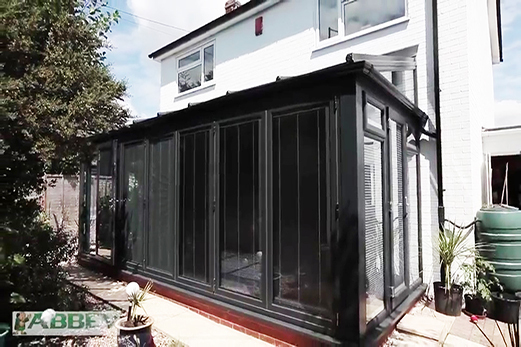 Lean-to conservatories are becoming a popular choice amongst homeowners in Reading, due to the weather-proof properties found in the high-performance frames. Each frame is designed to make sure your home is protected against harsh weather conditions. This is one of the most cost-effective home improvement solutions. This is because the slim sightlines and large double glazed glass panels mean more natural heat is trapped inside, making your home warm and comfortable all year round. The high-performance frames are manufactured to your exact design specifications, which means they are guaranteed to fit inside the space provided. This gives your home the best chance of staying warm, whilst you are protected from the harsh conditions outside. 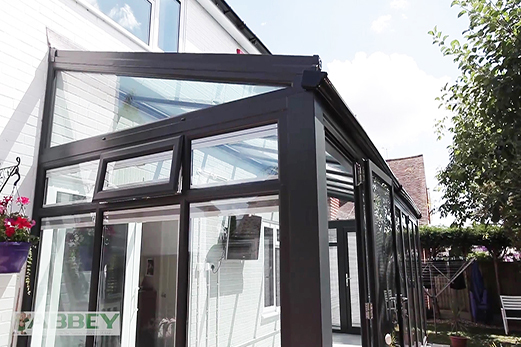 Manufactured by a market-leading company, your lean-to conservatory can be made in any colour to match or contrast the aesthetics of your home. Each one is designed to make your home feel newly renovated, brighter and more welcoming. Bi-fold doors offer exceptional benefits, guaranteed to suit any home on the market. Their smooth functionality ensures they are easy to use and discreet, making them perfect for any type of home. Whilst the couple’s children may have grown up, potential grandchildren can be kept safe and sound with the high-performance safety features. These doors are designed to keep your family safe. Fitted with the latest safety features, our range of high-quality bi-fold doors are designed to keep you safe from potential break-ins. This means you can go about your daily life, worry-free. Utilising a concertina opening functionality, the bi-fold doors on offer can provide you with unobstructed views of your surroundings. Seamlessly blending your home and your garden. We worked side-by-side with the couple to provide them with a space they can be proud of. With their brief being ‘modern and contemporary’, we designed a grey conservatory in varying shades to complement their home. The cool colour theme created a modern environment for them. Combining our knowledge with their dream, we included bi-fold doors that are perfect for ensuring their home is fully ventilated. We utilised integral blinds to make this home improvement build as low maintenance as possible. They are extremely happy with their grey conservatory and bi-fold doors, aimed at creating a contemporary environment to entertain guests in. This conservatory boasts all the benefits of modern living, making it a huge success! 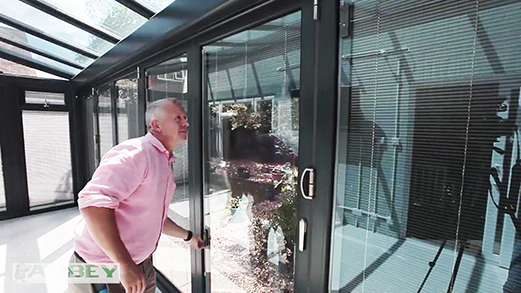 To hear more about the range of high-quality products, including lean-to conservatories and bi-fold doors, get in touch today. Call us on 0118 956 6866 and talk to our experts today. We will be happy to guide you through the range of products on offer, giving you key information. Our team are able to offer bespoke advice, tailored to your situation. Or, send us an email using the online contact form found on our website. We will get back to you as soon as possible, answering your questions in detail. Alternatively, use our cleverly designed online quote generator. 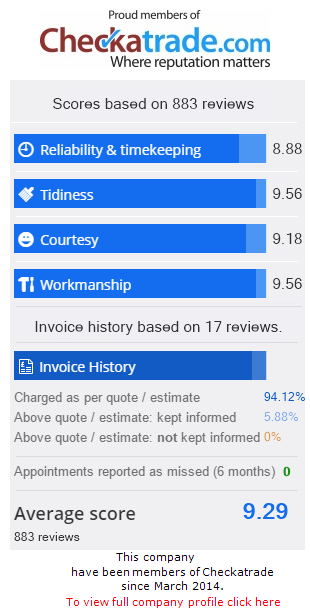 Made to give you a true estimate on your home improvement project, the quoting engine is a system you can rely on.